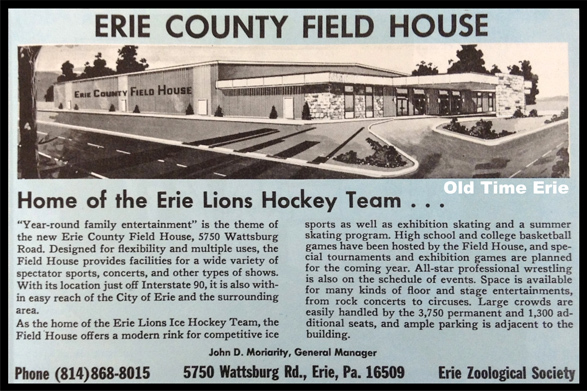 The Erie County Fieldhouse was home to professional and youth hockey in Erie, PA for many years. This event schedule gives you an idea of the number of games played during December of 1982. There were six Atlantic Coast Hockey League hockey games played at the Fieldhouse. The Erie Blades (or was it the Golden Blades?) played Hampton on Dec. 8th, Virginia on Dec. 10th and 11th and Mohawk Valley on Dec. 15th, 18th and 22nd. 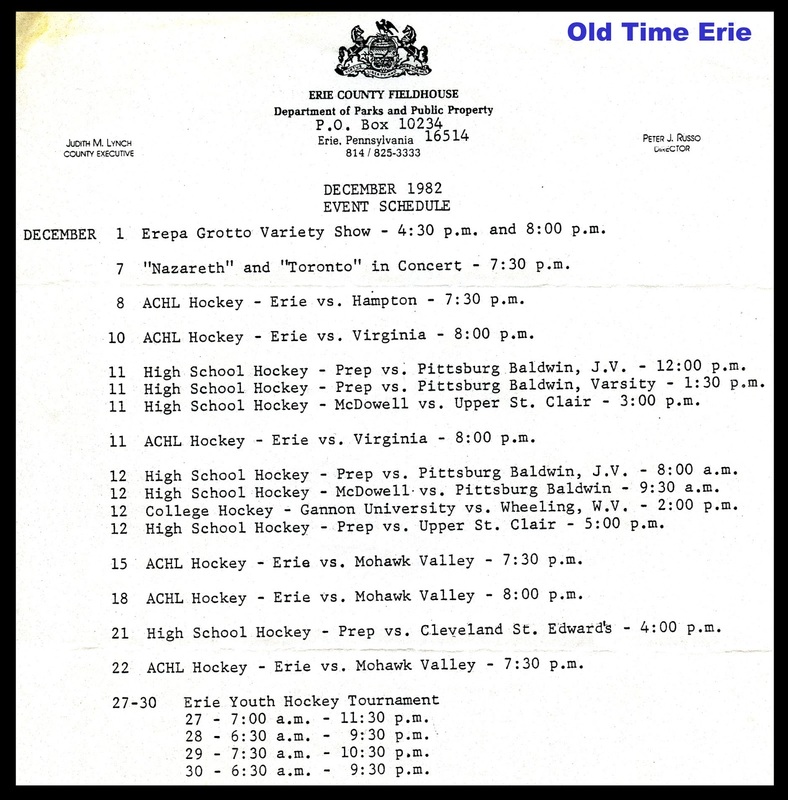 There was one college hockey game on Dec. 12th, when Gannon University played Wheeling, WV. High school games included Cathedral Prep vs. Pittsburg Baldwin on Dec. 11th and 12th; and Prep vs. Cleveland St. Edward's on Dec. 21st. McDowell High School played Upper St. Clair on December 11th and and Pittsburgh Baldwin on Dec. 12th. Erie Youth Hockey played a tournament at the Erie County Fieldhouse from Dec. 27th through Dec. 30th. Other events included an Erepa Grotto Variety Show on December 1st, and a concert by Nazareth and Toronto on December 7th. I remember the first concert that I saw at the Erie County Field House. It was loud and there were no seats on the floor, just lots of people sitting on blankets or standing up front. I could barely see the band on stage through the haze. I was hooked! The Erie County Fieldhouse was located at 5750 Wattsburg Road in Erie, PA, off of Route 8 near I-90. 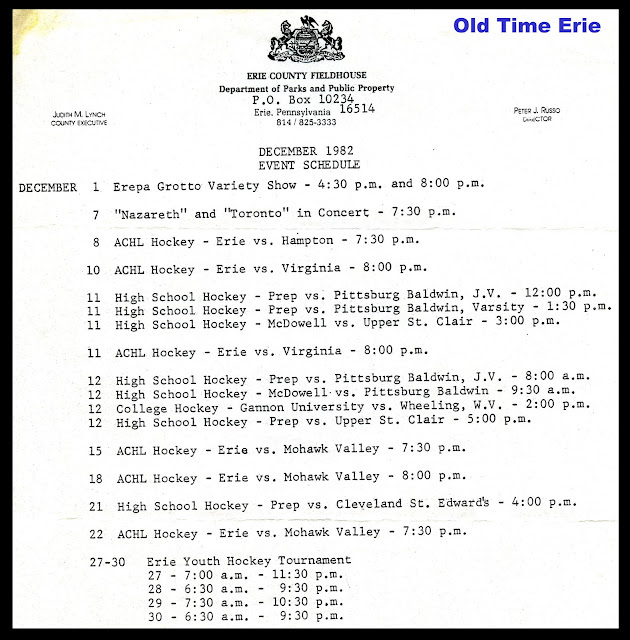 The Erie Lions played hockey there, as did the Erie Blades. When concerts came to town during hockey season, they covered the floor with sheets of wood. It was a little chilly, but no one complained. Some shows had an open floor plan and some had rows of metal chairs on the floor. I saw a ton of shows at the Field House. Off the top of my head, the ones I remember include Mahogany Rush, Head East, Sammy Hagar, Boston, Blue Oyster Cult, Nazareth, Shakin' Street, April Wine, Triumph, Blackfoot and Fastway. I'll add more when I find my ticket stubs. I worked at a record store, and we would take unsold tickets and money up to the Field House before the show. It was fun to watch them put piles of money in a counting machine. It was also fun to get free concert tickets, even if they only cost $7.75 each. We sold a lot of tickets to closed-circuit boxing matches. This was in the days before satellite TV and the Internet. We had a seating diagram that showed which tickets we had for sale, and would then cross off the seat numbers as they were sold. This was the days before Ticketron and Ticketmaster. There was always a handful of scalpers selling bootleg t-shirts in the parking lot before and after a concert. The shirts were cheap. When you washed them a few times, they shrunk or became deformed. 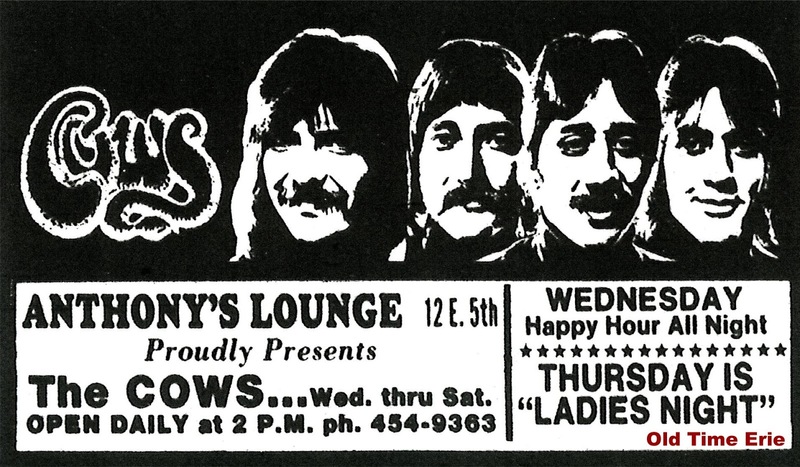 Here's a blast from the past...while the nation was getting ready to celebrate the Bicentennial, the Cows were getting ready to rock out at Anthony's Lounge in Erie, PA. This particular gig took place from May 19-22, 1976. Anthony's was located at 12 East 5th Street. The Cows included Ron Guzek on keyboards, vocalist Dennis Guzek, guitarist Richard Buckel and drummer Joe Salorino. They are shown in the advertisement above from left to right. Now it's your turn to share memories about your favorite songs and shows by the Cows. Be sure click on the title of this post and leave a comment in the white box on the next page. You wouldn't know that Theodore Roosevelt was a two-term ex-president by reading this ad for a speaking engagement in Erie in 1914. Roosevelt was heralded more for his role in the Spanish-American war than he was for his political acclaim as the 26th President, whose terms lasted from 1901 to 1909. "With occasional bursts of vigor of former days, and with an old throat trouble weakening his voice, Colonel Roosevelt made his second entrance into the campaign in Pennsylvania yesterday, with three speeches in Erie county. He talked at Girard, Erie and North East. His audiences were typically Rooseveltian. He came here from Chicago last night and rested at Jamestown, where he re-entered a campaign in New York state. Leaving a Lake Shore train at North Girard shortly before noon, in company with Hugh C. Lord and Henry Hinrichs, Jr., of Erie...Colonel Roosevelt launched immediately into a whirlwind five hour trip across the county. He talked to about 800 persons at North Girard and whisked through Girard, disappointing about 300 residents gathered in a park to hear him. Colonel Roosevelt arrived in Erie about 1 o'clock. He was immediately taken to private apartments engaged for him at the Lawrence Hotel, where he had dinner. By this time crowds began gathering and within a half hour it is estimated that four or five thousand persons were jammed in the streets and on the Academy grounds, originally selected for Mr. Roosevelt's speech." -Erie Dispatch-Herald, October 21, 1914. Hugh C. Lord was the founder of Lord Corporation. Henry Hinrichs, Jr. was the president of the Erie Board of Trade and the owner of the Keystone Fish Company. Old Time Erie 20 Miles to Boston Store photo courtesy of K. Baker. 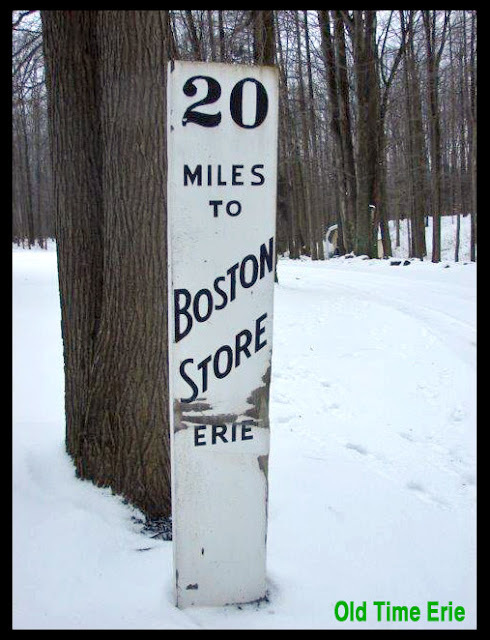 The Boston Store mile marker signs used to be spread out all over Erie County, PA. It seems like they were posted along the roadside every few miles on Route 20, Route 8, Route 5...name a state route and there they were Boston Store signs on it. They didn't look very tall when you drove by, but the signs are five feet tall from the ground to the top, and one foot wide. This is one piece of memorabilia that is rarely seen anymore, as most of the Boston Store mile marker signs are in private collections. The Boston Store was located at 718 State St. in Erie, PA. It is on the National Register of Historic Places. Old Time Erie Victor Dist. Co. photo courtesy of Tom DiLuzio. How sweet is this old Studebaker pickup truck! As you can tell from the logo painted on the door, this delivery truck was used the Victor Distributing Company. 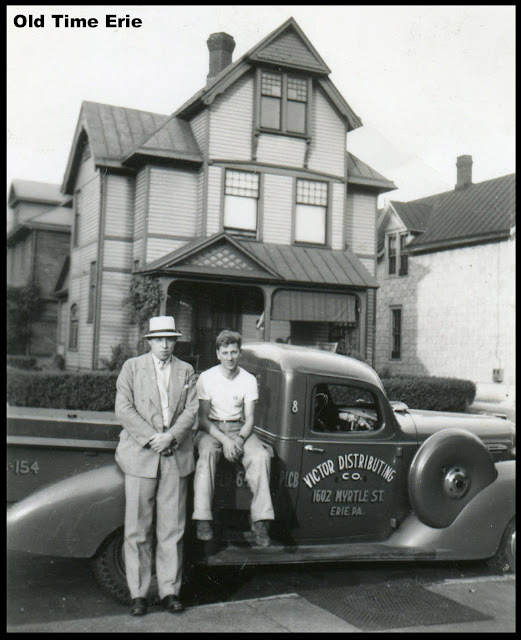 This beer distributor was located in Little Italy at 1602 Myrtle Street in Erie, PA in 1939. Victor was owned by Philip Sansone. Unfortunately, there are no names written on the back of this photo. Joseph Ferraro was the president of Victor Beer Distributing of Erie in 1938. Philip Sansone was the secretary/treasurer, and Anthony Sansone was a laborer at the business. The house in the background is located at 1601 Myrtle Street. It still stands, but has had some major changes. The small porch on the first floor is gone and a porch has been added to the second floor on the front of the house. This house sits on the southeast corner of West 16th and Myrtle. The building to the right of the house has been demolished. 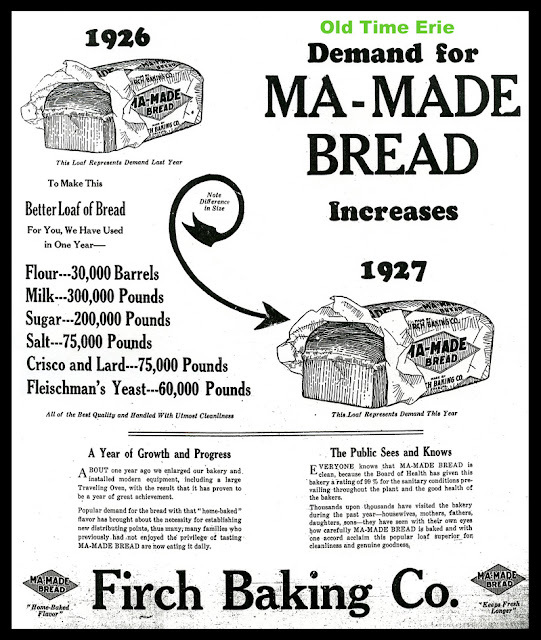 Old Time Erie Firch Baking ad from Erie Dispatch, Aug. 28, 1927. The Firch Baking Company was owned by the Firch family in Erie, PA. William Firch founded the company around 1889. He was one of the leading bakers in Erie prior to his death in 1917. William's son George Firch managed the bakery for a few years, and James B. Dwyer became president of Firch's around 1925. 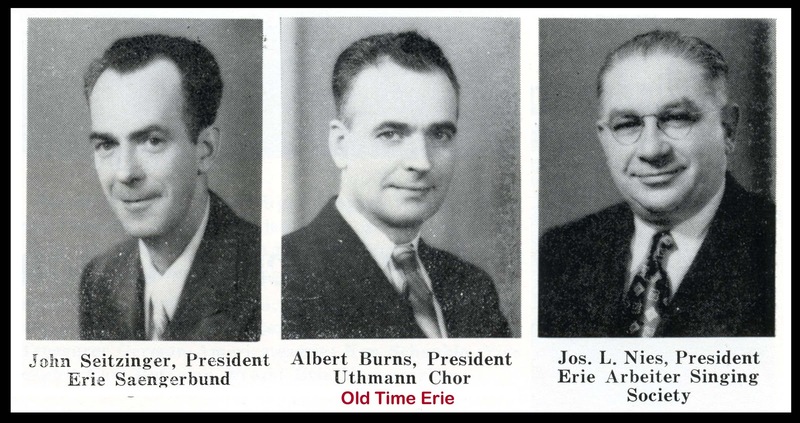 They made bread at 1902 Cranberry St. in Erie, PA. John Dwyer was president and Paul Dwyer was vice-president of Firch's in the sixties. According to this ad, "Everyone knows that Ma-Made bread is clean, because the Board of Health has given this bakery a rating of 99% for the sanitary conditions prevailing throughout the plant and the good health of the bakers...About one year ago we enlarged our bakery and installed modern equipment, including a large Traveling Oven, with the result that it has proven to be a year of great achievement." I guess I should clean the closet more often. I did not find my sweat pants, but I did find three pairs of shorts and this cool bag from the Boston Store in Erie, PA. I think you could fit a small child in this bag. I can't imagine lugging this thing on a city bus either. Unless it held a comforter or a stuffed lion. So, my question is, What is the biggest thing you ever bought at the Boston Store? If you would like to leave a comment, click on the title of the post above. Then type your comment in the white box near the end of the article. 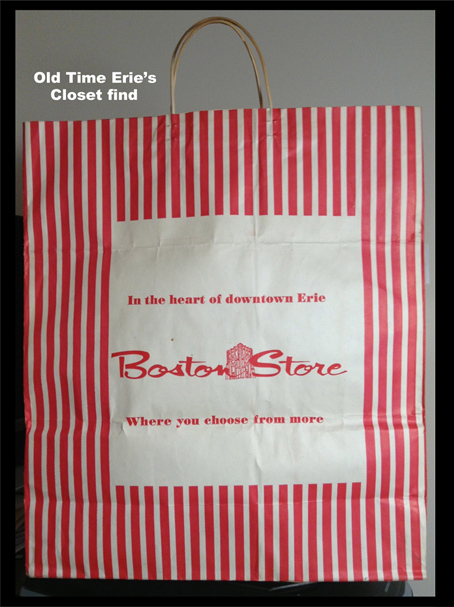 "The Boston Store, In the heart of downtown Erie, Where you choose from more." Old Time Erie ads from the 1970 General Telephone book, courtesy of Jeff George. 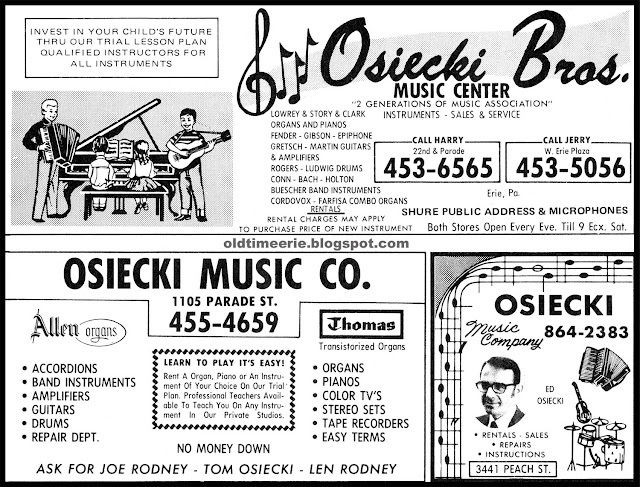 Discount Piano & Organ Sales, 504 West 8th St.
Erie School of Music, 2501 Peach St.
Froess Piano & Organ Co., 556 West 8th St.
Markham Music, 25 West 11th St.
Moore Music, 1007 West 6th St.
Osiecki Music Co., 3441 Peach St.
Ronzitti Music Store, 2603 Peach St. Tune Toppers Music & Studio, 1809 State St. There have been many retail stores that sold guitars, amplifiers, keyboards and drums over the years in Erie, Pennsylvania, but this one is limited to stores that existed in 1970. Old Time Erie photo of the Boston Store by John E. Baker, used with permission. I'll meet you under the clock at noon. If you grew up in Erie, PA, you know the exact location of "The Clock." 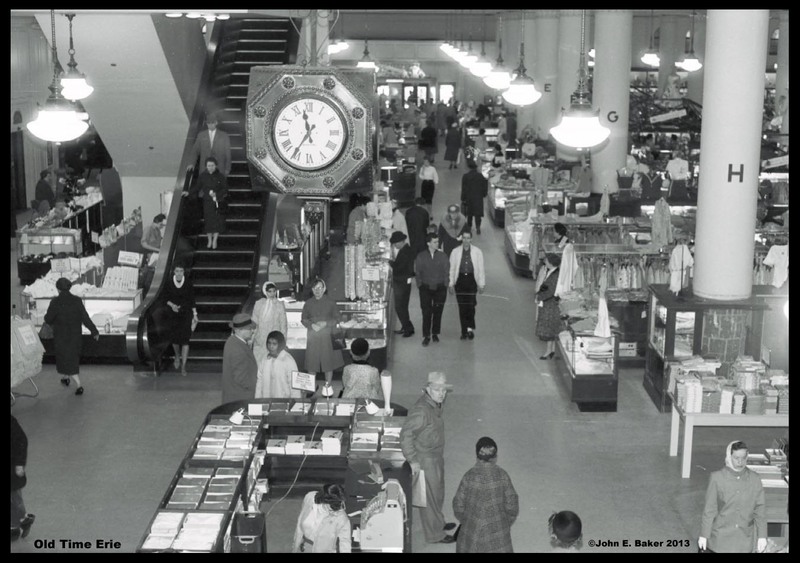 The clock was on the main floor of the Boston Store at 718 State Street. The ultimate retail shopping experience. A place where you could go with your mom or grandma. A place where you could meet your friends for a quick bite to eat. You could take the escalator to the mezzanine and watch all the people scurrying about on the main floor. The incredible photo shown above was taken by former Boston Store employee John E. Baker around 1961, looking east toward State Street. The Boston Store had multiple entrances, and when it was raining or snowing people often cut through the store to get to the opposite street. The main floor had a high ceiling with incandescent lighting, which is captured in the picture of the store. The pillars were identified by letter, starting with "A" near the State Street entrance. Each department had a sales person and a cash register. The Boston Store is on the National Register of Historic Places. What do you remember about the Boston Store? If you would like to leave a comment, click on the title of the post above. You can then type your comment into the white box near the end of the article. Can't wait to read your memories! Old Time Erie -ad in Erie Dispatch-Herald, May 7, 1939. Did you ever read something and do a double take, thinking you misread the text? That's what I did when I saw this ad. "Free! Basket of Groceries & Drugs"
The fine print says this offer is limited "to the first 100 people entering our store whether you make a purchase or not." 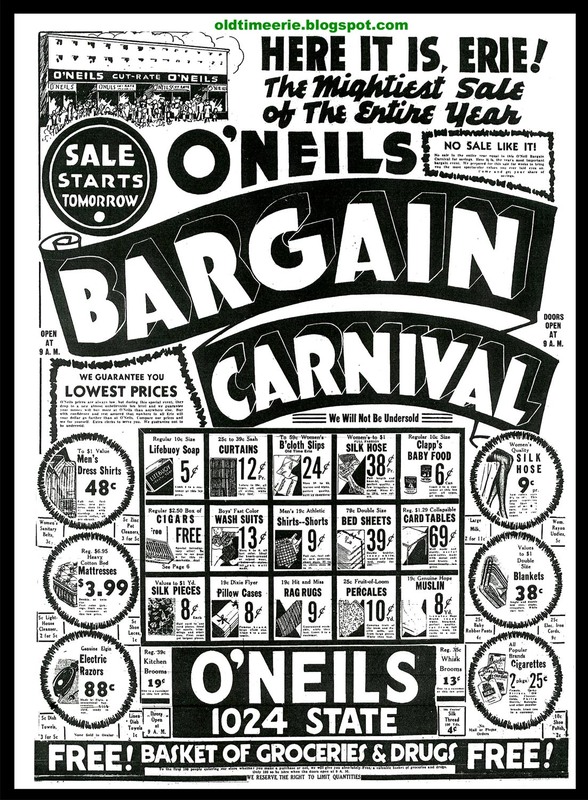 O'Neils was a retail discount store at 1024 State Street in Erie, PA.
O'Neils bargain store at 11th and State is long gone. Northwest Savings Bank currently occupies this site. 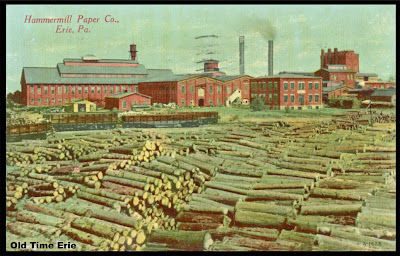 Hammermill log piles from 1911. 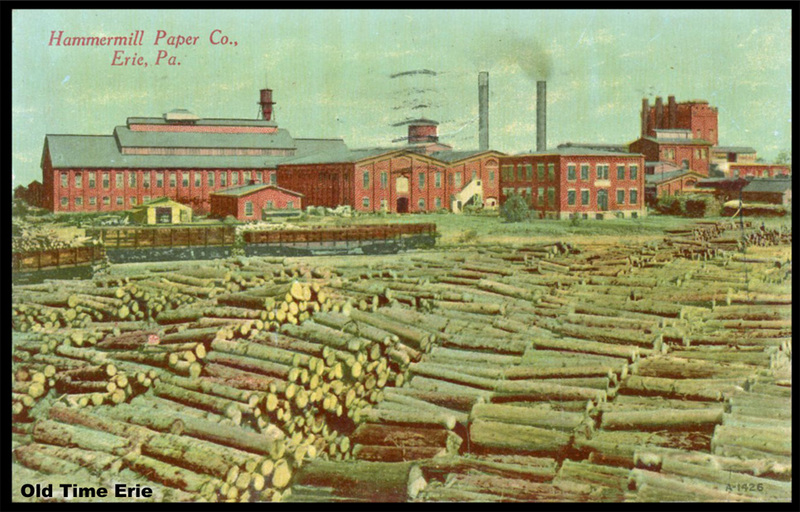 Postcard courtesy of Michele H.
Hammermill Paper Company needed a huge amount of wood to operate its pulp mill in Erie, PA. They brought in logs by boat, truck and railcar to the plant on East Lake Road. They stored piles of logs on the grounds of the plant. The Wayne Brewing Company had a brewery at 1701 Parade Street in Erie, PA for many years. The stubby Wayne Brew Pilsener Beer 12 ounce bottles were introduced in 1936. They had wooden crates scaled to the size of the 6.5" bottle so they could be easily loaded onto delivery trucks; take-out 24 packs had a different carrier. 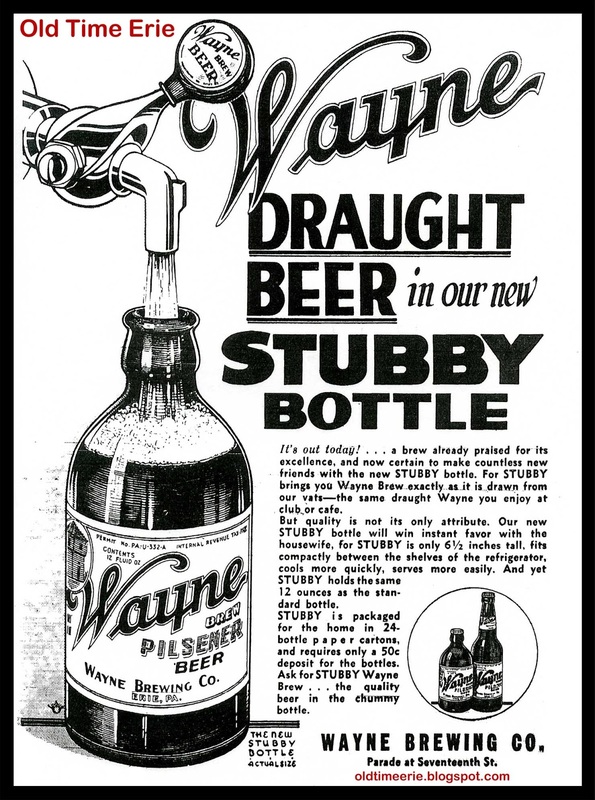 Wayne Brewing items are highly collectible, and are often seen in antique shops and on eBay. Wayne Brewing had at least six main buildings in its heyday. The bottling house was located on the northeast corner of East 17th and Parade. The main complex was on East 17th Street behind the two buildings on the southeast corner of East 17th and Parade. Chestnut Street Garage photo courtesy of Tom DiLuzio. The Chestnut Street Garage, located at 1711 Chestnut Street in Erie, PA had a unique feature...two curbside globe gas pumps. The City of Erie banned these pumps many, many years ago because some of them had gas tanks right under the street. About the only time you see those vintage pumps anymore is on an episode of American Pickers. An alley ran parallel to the gas station, and led to the automobile garage to the east of the gas station. The red brick building on the left is now occupied by Dobrich Electric. The two small houses to the right have since been demolished. Arthur Young lived at 1715 Chestnut St. in the 1920s. Frederick Reymore lived at 1717 Chestnut St. in the 1920s. The two-story building to the right of the two small houses was on the northeast corner of 18th and Chestnut. The second-floor apartments had an address of 1721 Chestnut Street and the businesses that fronted Eighteenth Street had an address of 364 West 18th St., 362 West 18th St. and 360 West 18th St. 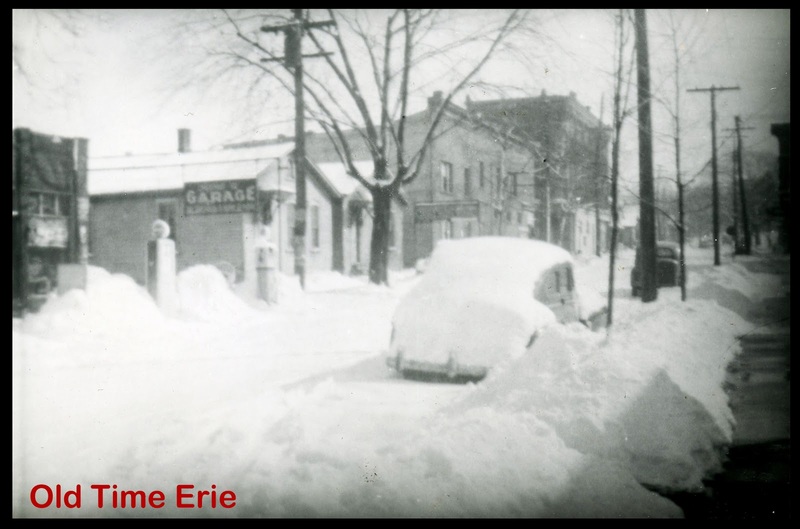 This winter street scene of Little Italy in Erie, PA was probably taken in 1938, based on the globe gas pumps and the cars. Plus, Joseph Ferraro, who lived right near where this photo was taken, very likely took this picture. Phillips Fruit Co. photo courtesy of Tom DiLuzio. 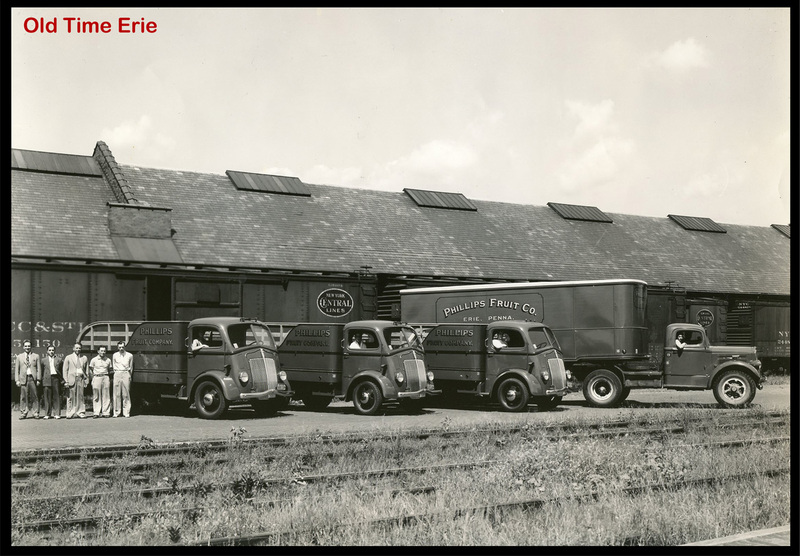 The Phillips Fruit Company was based in Erie, PA for at least 45 years. These wholesale fruit dealers got their start as the L. Phillips' Sons Co. They were located at 451 West 16th Street in 1922. The company was run by Angelo and Joseph Phillips, the sons of Louis and Elizabeth Casciani Phillips. As the business grew more prosperous, they moved to larger quarters. In 1929 they were located at 11 West 16th Street, across the street from the Central Market. In 1933, the L. Phillips' Son Company included President Angelo Phillips, Vice-president Sam Corso, and Secretary/treasurer Joseph Phillips. Albert Phillips was co-owner of the Phillips Fruit Company in 1946. In 1967, the Phillips Fruit Company made its home at 1502 Parade Street, and was run by Joseph and Albert Phillips. According to the license plates, the picture above was taken in 1938. The trucks all bear the name Phillips Fruit Co., Erie, Penna. The three on the left are 1937 White Model 802 COE (Cab Over Engine). There are nine men in the picture, but they are not identified by name. It's interesting to note that there are several New York Central Railroad boxcars behind the men, and a couple more sets of tracks in the foreground. 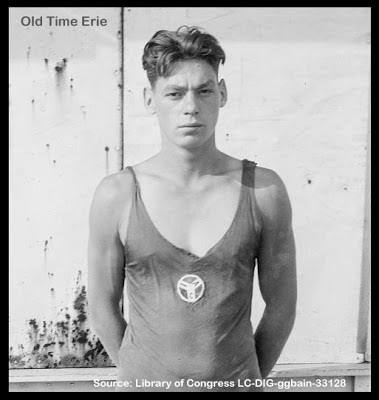 Olympic gold medalist Johnny Weissmuller visited Erie, Pa on December 15, 1915 as a guest of YMCA director James C. Ainsworth. If the name Johnny Weissmuller doesn't ring a bell, it should. He was the star of a dozen Tarzan movies, starting with 'Tarzan the Ape Man' in 1932. He then played Jungle Jim in a series of movies (and later a TV series) during the forties and fifties. Johnny got his start as a freestyle swimmer, winning five gold medals in the Olympics, three in 1924 and two in 1928. He also set 67 world records. Johnny appeared at the Downtown Y on West 10th Street. "The largest audience ever to witness a swimming exhibition in this city jammed its way into the limited capacity of the Y.M.C.A. tank last night and was amply rewarded...The biggest upset of the program, however, was Bill Wright's triumph over Johnny Weismuller, world's champion swimmer, in a special 40-yard race...It was this same Wright that finished second to him last year in the Olympic trials that saw the Erie boy disqualified. -Erie Dispatch-Herald, December 16, 1925. The 'Erie boy' that Weissmuller competed against was William Wright. Photo from Hamot Hospital Association 1921 Annual Report. Here are a few donations to Hamot Hospital during 1920. Do you see any familiar names on this list? Times Square Roof sold used cars at East 12th and French Street in Erie, PA. 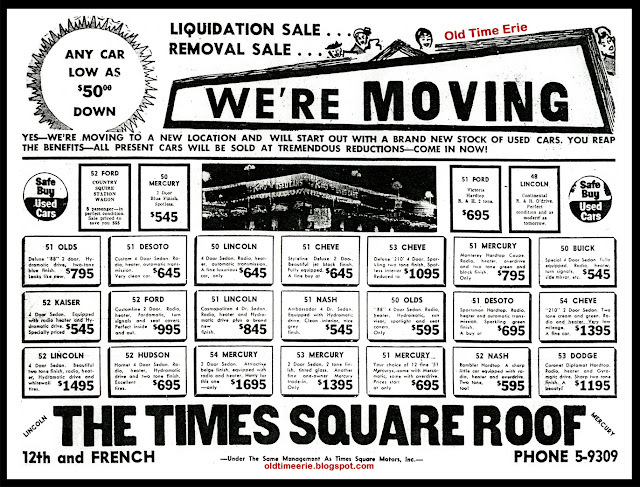 According to this advertisement that ran in the Erie Daily Times on August 5, 1955, Times Square Roof was under the same management as Times Square Motors, Inc. Check out the prices for used cars. A 1952 Kaiser four-door sedan sold for $545. A 1952 Hudson Hornet sold for $695. A 1952 Nash Rambler hardtop would set you back $595. A 1953 Chevy 210 Deluxe was one of the pricier models at $1095. A 1954 Mercury two-door sedan sold for $1695. Buying a used car was pretty simple, just cough up a $50 down payment and you were ready to go. Cutting ice on the bay in Erie, PA. Postcard courtesy of Tom DiLuzio. Back before refrigerators and freezers were commonplace in every kitchen, ice was harvested from the Lake Erie for use in iceboxes. 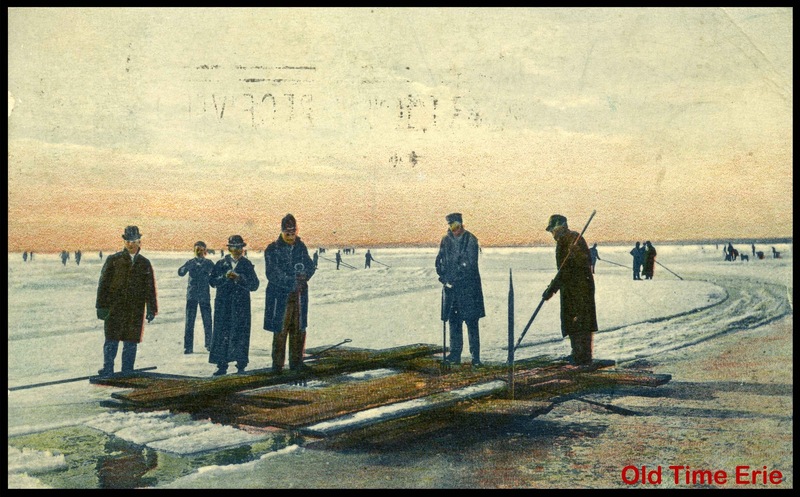 Every winter, men would work long hours on the bayfront cutting and harvesting ice. The postcard above, which was sent in 1907, shows men pushing giant blocks of ice along a channel on the bayfront at Erie, PA. Men with giant grappling hooks would pull blocks of ice out of the water. The ice was stored in warehouses such as the one that was recently torn down on 14th and Parade Street, and then sold to people in the City of Erie. Customers would place a placard in their window with a number showing the size of ice they needed, for example, 25, 50 or 100. The placard designated the weight of the block of ice; 25 equaled 25 pounds. Commercial ice companies such as the Union Ice Company also had small buildings called ice stations throughout the city. Parents would send children there with a wagon. They would pay for a block of ice and then lug it home in the wagon. Milk companies such as Sanida and Sterling used giant blocks of ice in their delivery vehicles to keep milk cool for home deliveries. 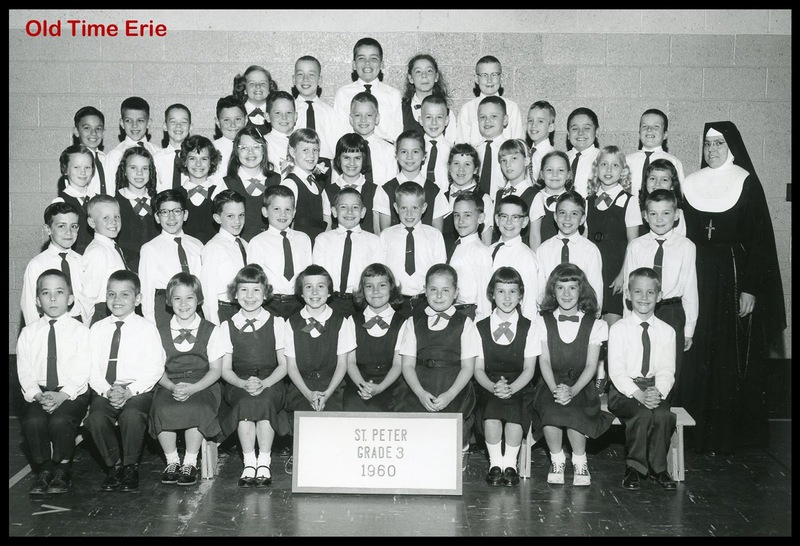 The Diocese of Erie operated 22 parochial grade schools within the limits of the City of Erie, PA and Millcreek Township in 1960. About half of those schools are open today; some closed outright and others merged to become one school. Saint Peter's, 130 West 11th St. Had 201 boys and 187 girls enrolled in 1960; students were instructed by the Sisters of St. Joseph. Still open. Saint James, 2522 Buffalo Rd. Had 307 boys and 313 girls enrolled in 1960; students were instructed by the Sisters of the Congregation of the Divine Spirit. Still open. Saint George, 5101 Peach St. Had 485 boys and 415 girls enrolled in 1960; students were instructed by the Sisters of Mercy. Still open. Blessed Sacrament, 2510 Greengarden Blvd. Had 509 boys and 452 girls in 1960; students were instructed by the Sisters of St. Joseph. Still open. Saint Luke's, 425 East 38th St. Had 428 boys and 392 girls in 1960; students were instructed by the Sisters of Mercy. Still open. Saint Jude's (Our Lady's Christian), 606 Lowell Ave. Had 293 boys and 259 girls in 1960; students were instructed by the Sisters of St. Joseph. Still open. Our Lady of Peace, 3201 West 28th St. Had 300 boys and 301 girls in 1960; students were instructed by the Sisters of St. Joseph. Still open. Holy Rosary, 1020 East 28th St. Had 343 boys and 294 girls in 1960; students were instructed by the Sisters of St. Joseph. Merged with St. John's. Saint John's, 504 East 27th St. Had 416 boys and 424 girls in 1960; students were instructed by the Sister of St. Joseph. Merged with Holy Rosary. Holy Family, 1147 East 9th St. Had 146 boys and 130 girls in 1960; students were instructed by the Sisters of the Third Order of St. Francis. Merged with St. Ann's and St. Casimir's. Saint Ann's, 1022 East 10th St. Had 89 boys and 99 girls in 1960; students were instructed by the Sisters of St. Joseph. School closed in the early 1980s when it merged with Holy Family. Saint Casimir's, 664 Hess Ave. Had 148 boys and 155 girls in 1960; students were instructed by the Sisters of the Holy Family of Nazareth. School closed in 1982 and merged with Holy Family. Saint Patrick's, 217 East 4th St. Had 256 boys and 211 girls in 1960; students were instructed by the Sisters of St. Joseph. Closed in 1990. Saint Mary's, 310 East 10th St. Had 158 boys and 151 girls in 1960; students were instructed by the Sisters of St. Benedict. Closed. Saint Joseph's, northeast corner of West 25th and Sassafras St. Had 194 boys and 172 girls in 1960; students were instructed by the Sisters of St. Joseph. Closed in 2000. Saint Stanislaus, 1203 Wallace St. Had 322 boys and 279 girls in 1960; students were instructed by the Sisters of the Holy Family of Nazareth. Closed in 2001. Saint Paul's, 417 West 16th St. Had 115 boys and 105 girls in 1960; students were instructe by the Sisters of St. Joseph. Closed in 1984. Sacred Heart, 2511 Plum St. Had 338 boys and 400 girls in 1960; students were instructed by the Sisters of St. Joseph. Closed in 2007. Holy Trinity, 651 East 22nd St. Had 178 boys and 180 girls in 1960; students were instructed by the Felician Sisters. Closed in 1997. Saint Hedwig's, southeast corner of East 3rd and Wallace St. Had 100 boys and 90 girls in 1960; students were instructed by the Felician Sisters. Closed in 1984. Mount Calvary, 426 Eagle Point Blvd. Had 138 boys and 153 girls in 1960; students were instructed by the Sisters of St. Benedict. Closed. Saint Andrew's, 606 Raspberry St. Had 332 boys and 367 girls enrolled in 1960; students were instructed by the Sisters of St. Joseph. Closed. There were also several Catholic high schools in Erie, including St. Ben's (St. Benedict) High School. Whatever Happened to Joe Root? "A lot of people think that Joe Root could have claimed Presque Isle Peninsula for his own. But---even if he had known about 'squatter's rights'---the legendary hermit would never have used his privilege because he believed that nature was free. During the late 19th century, Joe became famous as the 'King of the Peninsula' when he made his home in a dirt-floor shack near what is now Water Works Park. Feasting on a diet of roots, berries, and raw fish, he claimed that he never went hungry because---when the raw fish ran out---he would eat fried mosquitos. Since man does not live on mosquitos alone, he would often visit the city where---for the price of a beer---he would delight the patrons of Sullivan's Tavern with one of his wild schemes. Insisting that the only thing he needed was capital, Joe would reveal plans of a balloon farm that would fly passengers from the Peninsula to Buffalo. His other schemes included a 'feather farm' and a circus comprised of bay district residents who were to wheel animals across a tightrope in a wheelbarrow. But a lack of capital wasn't his only problem. Although he was quite harmless, his eccentric appearance would often frighten potential investors. He dressed in a bear skin coat and an old felt hat. He wore only one shoe; his other foot was covered with a burlap bag. But the hermit's pride was his trousers. Wearing up to five pairs of pants at a time, he would arrange them so that each pair covered up the holes in the pair beneath it. Although he lived close to the lake, he was averse to bathing and, on dark nights--- if you couldn't see him---you could smell him. A believer in the 'natural look,' Joe shaved his grey beard only at Christmas. In spite of his frightening appearance, he remained a friend to many of the towns-people---including the police. John Carney, author of 'Tales of Old Erie,' writes of the only incident in which Joe caused problems for the police. Arrested on the basis of circumstantial evidence for stealing some fishing tackle from a local boat owner, Joe was lodged in the county jail while awaiting trial. After making friends with the warden, the hermit hired him as his lawyer for a $4,862.83 fee. When the judge rejected his attorney and appointed the public attorney to handle the case, Joe insisted on calling himself Chief Kickapoo, leader of a tribe of Indians and the world's greatest tightrope walker. Convinced that the strange old man was 'crazy but honest,' the judge acquitted him. But Joe refused to leave the jail where he was well fed and where he had planned a balloon flight with the warden. After much persuasion, he finally left the jail and returned to his driftwood shack on the Peninsula. Joe's greatest love was children. Young hikers on the Peninsula would seek the hermit and listen to him imitate the birds and talk to the animals through his felt hat. A natural ventriloquist, he would converse with an imaginary duck that the children had named Joe. But Joe---not Joe Duck, Joe Root---was a loner at heart. His evenings were spent in his small shack where he was protected from the heat by an air conditioner that consisted of ice chunks placed in the pockets of a pair of trousers that hung from the roof. As the hermit grew older, he was persuaded to leave the Peninsula and enter the County Home. But he couldn't live away from his beloved Presque Isle and he returned to it for the last time in 1910. By now, the 'respectable' elements of the town---who were frightened by this strange primitive---had decided to rid themselves of the old man. So they 'captured' him and had him committed to Warren State Mental Hospital. It was a sad end for a good man---especially a man like Joe Root." 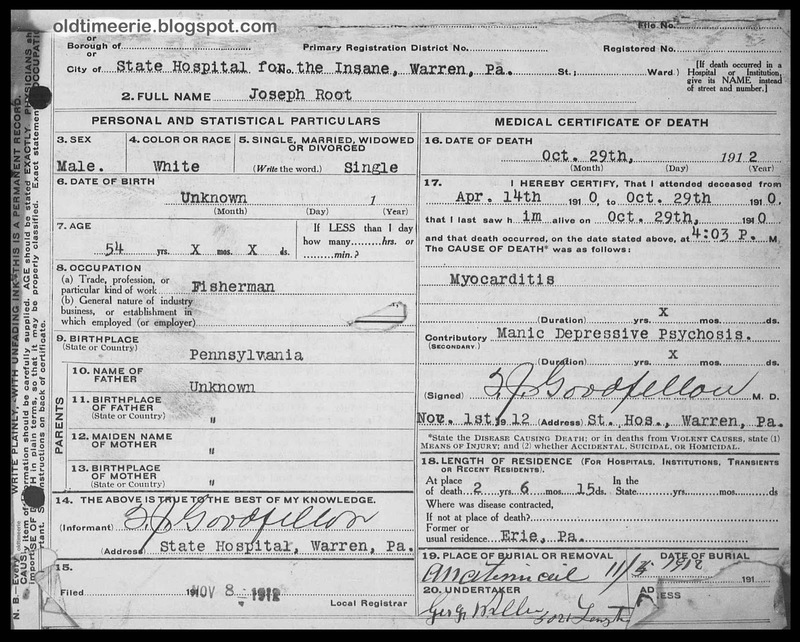 Postscript: Joseph 'Joe' Root died of myocarditis and manic depressive psychosis at Warren State Hospital on October 29, 1912. 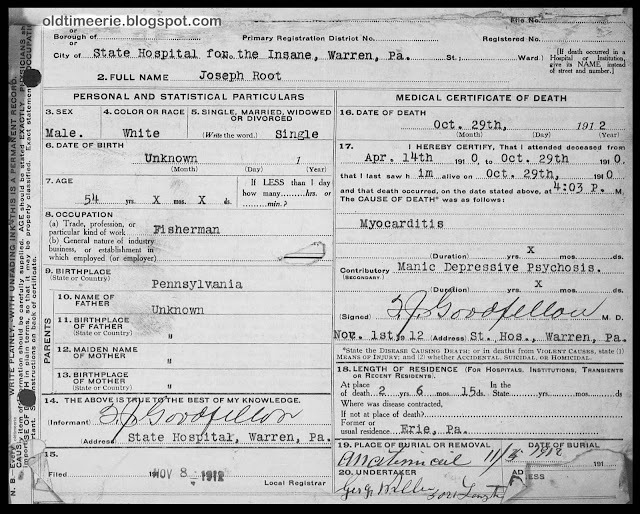 His body was sent to the Anatomical Board in Philadelphia, PA. Joe Root has become a legendary figure in the history of Erie, Pennsylvania. Labels: Erie legends, Erie PA, Joe Root, Legend of Joe Root, Peninsula, Presque Isle State Park, Warren State Mental Hospital. Old Custom House photo courtesy of Tom DiLuzio. 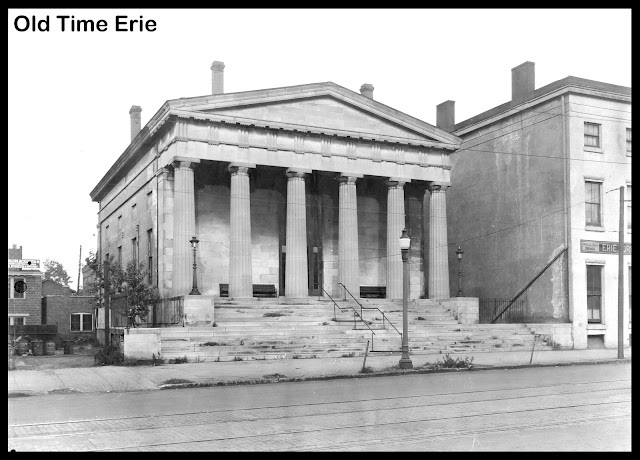 The Old Custom House, the current home of the Erie Art Museum, opened in 1838 as the Erie branch of the Bank of United States. This photo, which was taken around 1922, shows the Custom House at 415 State Street in Erie, PA. This building was designed by William Kelley of Philadelphia, PA. It was sold to the U.S. government in 1849. The left side was used as a post office for a time. Military veterans in the Grand Army of the Republic met in the Custom House after the post office relocated to a new building. Fans of Ace Frehley had premium spots on the Custom House stairs on when Ace headlined Celebrate Erie on August 18, 2012. The stage was set up in the middle of State Street just north of this shot. Mayor Joe Sinnott joined Ace on stage to sing "New York Groove." The building on the right, the old Cashier's House at 419 State Street, was occupied by the Erie Drug Company when this photograph was taken. 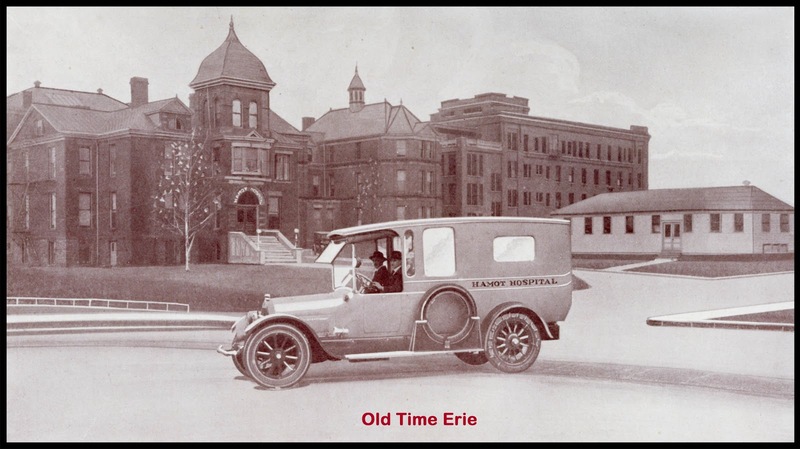 Emmett D. Hurley was the president of Erie Drug Co., and William Webster was manager of this wholesale drug company. Two sets of trolley tracks run in the center of State Street in the foreground of this picture. The building on the left, behind the Old Custom House, was occupied by the Lawrence Welding & Blacksmith Company at 11 East 4th Street. The business was owned by Peter Lawrence. The people at Marx Toys knew they had a hit on their hands when they came out with the Big Wheel in 1969, so they scaled it down a bit for the younger kids. Before you knew it, the Little Wheel was on the market. The Big Wheel was 38" long and the Little Wheel was 30" long and 19" high. 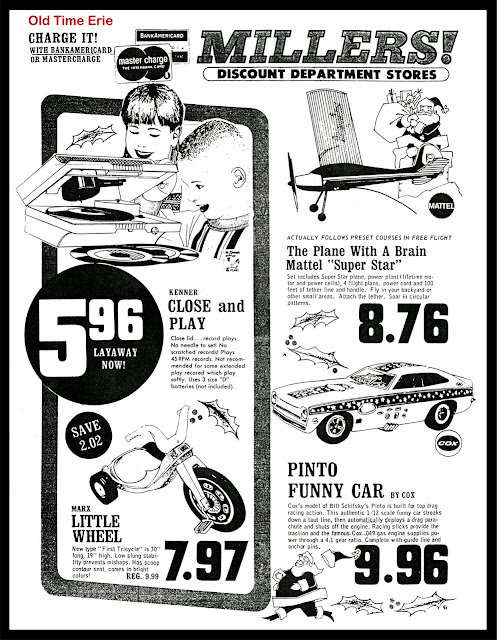 The Little Wheel was on sale for $7.97 when this ad ran in the Erie Morning News on November 15, 1972, just in time for children to add it to their Christmas wish list. 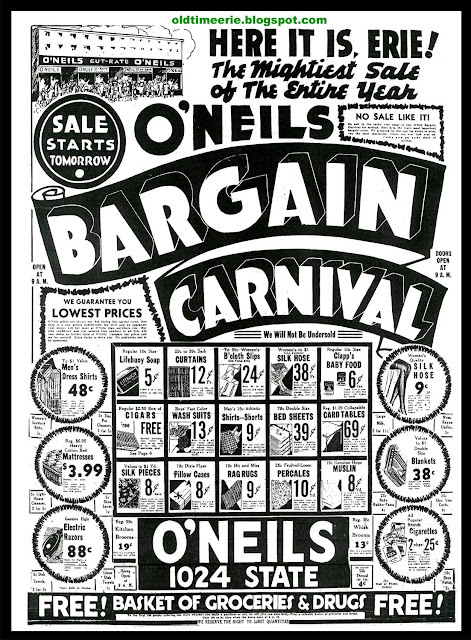 Millers Discount Department Stores were located in the Eastway Plaza and at 2330 West 26th Street (near Pittsburgh Avenue) in Erie, PA. James Pettinato was the manager at the West 26th Street store in 1972. Marx Toys were made by the Louis Marx Company. They had a plant at 1816 Raspberry Street in Erie. Remember the first time you saw one of your friends screaming down the sidewalk on a Big Wheel? 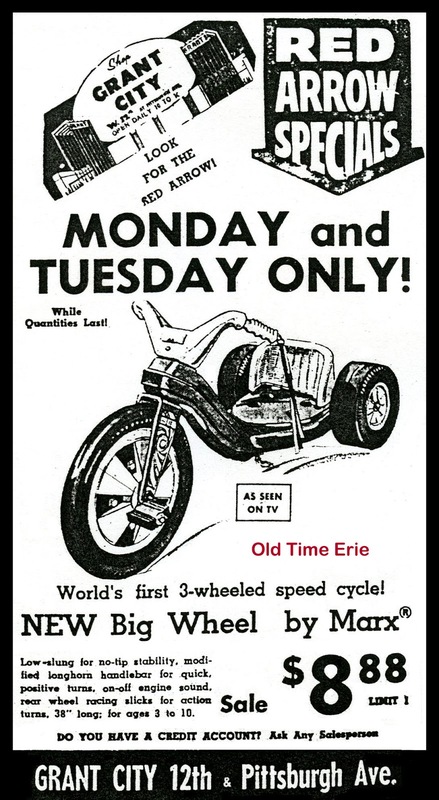 Most kids back then didn't know that Marx manufactured Big Wheels in Erie, PA, unless one of their relatives worked at the plant. The Big Wheel was billed as the world's first three-wheeled speed cycle. The ad to the left ran in the Erie Morning News on November 3, 1969, just in time for children to add the toy to their Christmas wish lists. The Big Wheel was on sale at Grant City at 12th and Pittsburgh Avenue for only $8.88. Good luck finding one for that price today. The Big Wheel was "Low-slung for no-tip stability, modified longhorn handlebar for quick, positive turns, on-off engine sound, rear wheel racing slicks for action turns, 38" long; for ages 3 to 10." I only knew a couple of kids that had Big Wheels, and from what I remember, the front wheel quickly developed a flat spot from jamming on the pedal brake or doing the Tokyo Drift. Marx Toys were made by Louis Marx Company. They had a plant at 1816 Raspberry Street in Erie, Pennsylvania. Northeast Erie, PA bird's eye view ©John E. Baker 2013, used with permission. 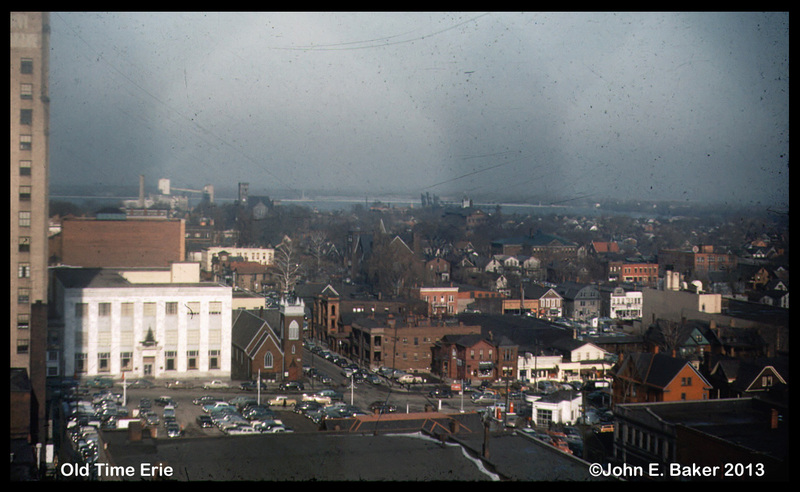 Let's step back in time and check out this view of northeast Erie, PA from the Commerce Building. This spectacular shot was taken by John E. Baker. How many landmarks you can spot? The tall building on the left is the Baldwin Building. The large white building is the General Telephone Company at 20 East 10th St. Saint Patrick's Church hugs the horizon. There's a small white Atlantic Gas station sitting at an angle on the southeast corner of 10th and French. Attorney Sesler's office is in the red house to the right of the gas station. The block east of French Street between 10th and 9th has really changed since this photo was taken. If it doesn't look familiar, it's because Jerry Uht Park now occupies the block, and the Erie Insurance Arena currently sits to the north of the ballpark. Yes, the Erie Seawolves and the Erie Otters are playing right in someone's old backyard. You can just see the edge of Sears Roebuck Department Store on the right side of this shot. Leave a comment if you can identify any of the other buildings in this photo. 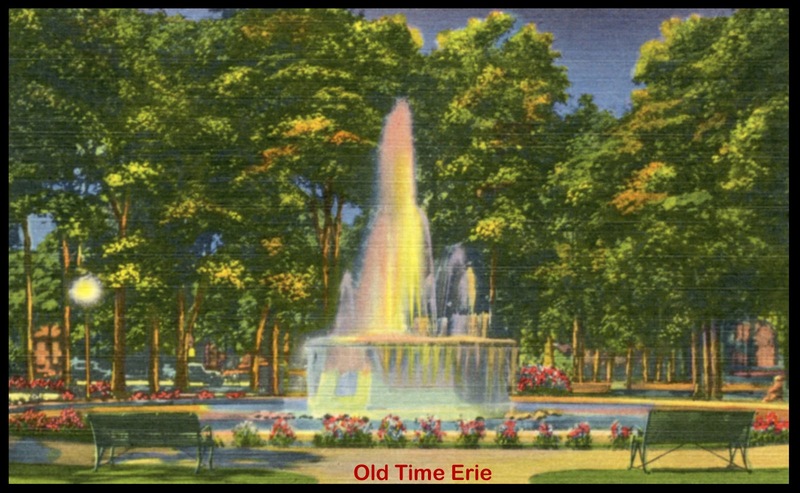 New Edison Electric Fountain postcard courtesy of Michele H.
The fountain in the east park of Perry Square was dedicated with a huge celebration on October 22, 1929, when the Chamber of Commerce presented the structure to the City of Erie, PA. The ceremony kicked off with a military parade led by the 112th Regimental Band, followed by the Academy High School Marching Band, the Erie Drum and Bugle Corps, the American Legion Drum and Bugle Corps and the Veterans of Foreign Wars. The parade started on 18th and State and ended at Perry Square. The fountain was dedicated to Thomas Edison in honor of Light's Golden Jubilee, a week-long celebration of the invention of the electric light. The Edison Electric Fountain was constructed by General Electric for $16,500 and was the pride of Erie when it was finished. The City of Erie paid $5,000 and the remainder of the money was raised by private citizens through popular subscription. "Said to surpass even the Atlantic City fountain, there will be eight changes in water effects, the entire light cycle requiring 10 minutes for completion. For each water effect there will be 12 changes in lighting effects, or a total of 96 combinations to each cycle." -Erie Dispatch Herald, October 22, 1929. A number of dignitaries were present when the Edison electric fountain was dedicated, including Erie Mayor Joseph Williams, local G.E. head H. L. R. Emmet, Charles H. Strong, W. Pitt Gifford and judge/congressman/state representative Henry A. Clark. Knowing the history makes me look at the fountain in a whole new light (no pun intended). My aunt moved to the Los Angeles area, and whenever she came back to Erie for a visit, she had to go see the 'colored water' in Perry Square. Old fountain in Perry Square. Postcard courtesy of Tom DiLuzio. 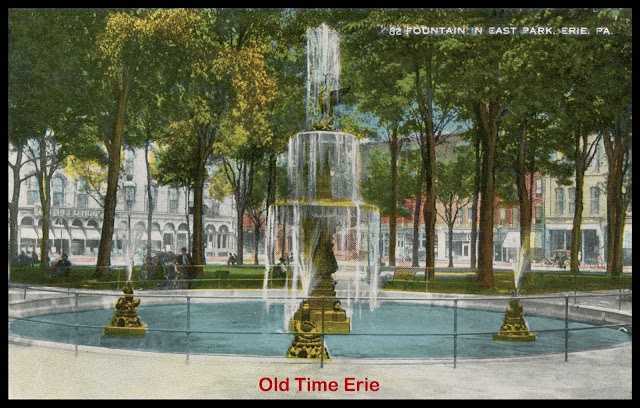 The old fountain in the east park of Perry Square was replaced in 1929. You can see the Reed Hotel in the background on the left on North Park Row, and the Becker Block on the right along French Street. I'll bet kids got yelled at for jumping the rail and splashing in this fountain on a hot summer day.